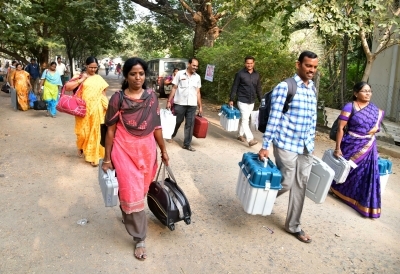 Over 10% polling in Telangana by 10 a.m.
Hyderabad, Dec 7 (IANS) Over 10 per cent polling was recorded by 10 a.m. in Telangana Assembly elections on Friday, official said. Polling began at 7 a.m. in all the 119 constituencies in the first full-fledged elections in India's youngest state. Voting was underway in all 32,815 polling stations spread across 31 districts. Polling began late in some polling centres due to technical glitches in Electronic Voting Machines (EVMs), the poll official said.